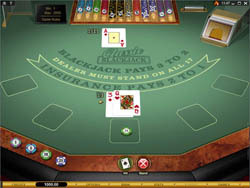 In this Classic Blackjack game, the dealer always stands on 17. You can only split like pairs, and you can only split once. After you split aces, you can draw multiple cards. Drawing a 10-point card after splitting aces only counts as 21, not blackjack. You can only double down on hands to a value of 9, 10, or 11, and only on your first 2 cards. The double down bet equals your original bet. You cannot double down after a split. Finally, there is no late surrender option in Classic Blackjack. Minimum bet is 1 and maximum bet is 500 (USD/GBP/Euro). Wagers are made with one of 8 different chip sizes, so you can always bet exactly how much you want. Winning a hand without blackjack pays at 1:1, and with blackjack it pays at 3:2. Insurance pays out at 2:1, but does not cover any second hands after a split, or any hand after a double down. One of the best features of Classic Blackjack is its ease of use. The interface is very simple and intuitive, and there is no learning curve for the game so the moment you open it up, you can start playing. Everything you need is right at your fingertips. Better than that, the graphics are brilliant! The top-down perspective gives you a great view of the action, and everything, from the chips to the plus green table, looks very realistic. The angled perspective on Classic Blackjack Gold version, gives you a great view of the action. Chips and cards look very realistic, and subtle animations really give the game a nice touch of style. Classic Blackjack Gold, without doubt, makes for an outstanding blackjack experience. Are you ready to try counting cards? Sorry, no luck. On the internet, counting cards at blackjack is basically impossible. Since there are no pit bosses looking over your shoulder while you pay online, casinos can’t catch card counters, so they have shut them off by shuffling the shoe after every hand, making it impossible to keep track of the count. Instead, use strategy charts to get ahead. Classic Blackjack certainly has a lot going for it. It is a simple one deck, single player game with basic rules, yet it has all the elements a player wants in a blackjack game. This makes it a great choice for beginners and advanced players alike. All of this in a good looking game – what more do you need?